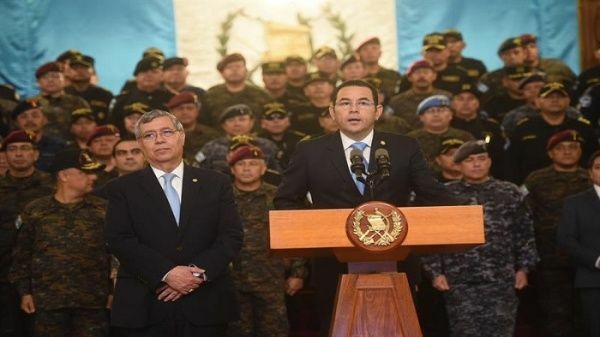 The day after Guatemalan President Jimmy Morales ordered armored vehicles donated by the US to surround the offices of the International Commission Against Impunity in Guatemala (CICIG), Mario Valdez got to work in Guatemala City’s Constitution Square. 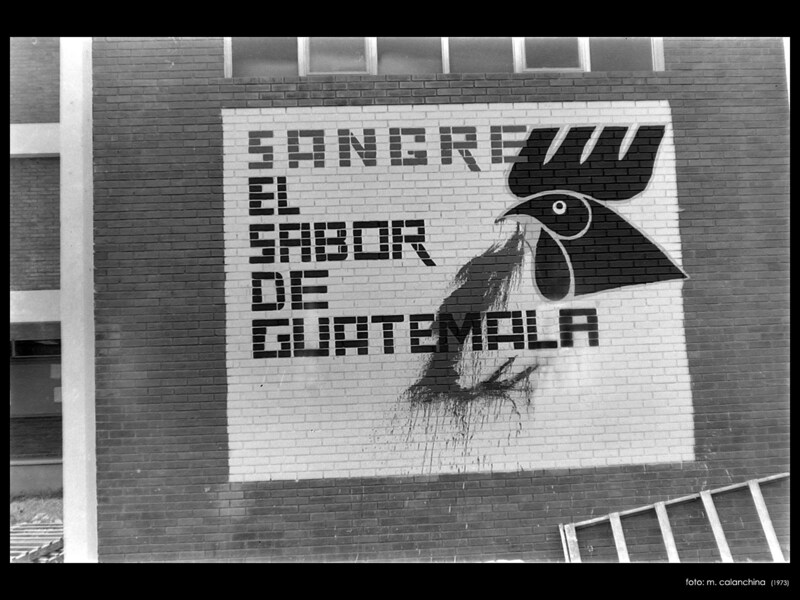 He needed just two and a half hours to create an unforgettable image of how he believes power operates in Guatemala. Untitled work by Mario Valdez. See more of his work on Instagram at mariov_art. President Jimmy Morales at his press conference, August 31, 2018. 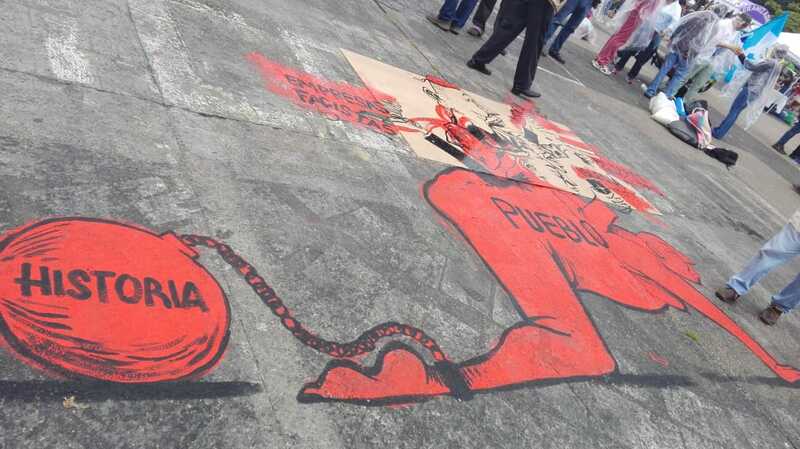 Courtesy of Telesur. 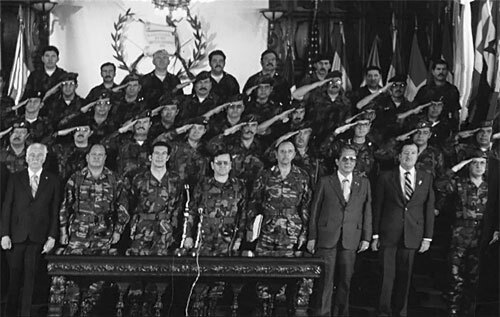 Images have circulated online comparing Morales’ press conference with an appearance made by Ríos Montt in 1982 after he seized power in a coup d’état. Montt was convicted in 2013 of ordering acts of genocide during Guatemala’s 36-year armed conflict. He was the first leader in history to be convicted of such a crime by a court of his own nation. Ríos Montt (left of microphone) after taking power by coup d’état, 1982. Behind the military, in his painting and in life, said Valdez, “Damn right CACIF is there. The fascist executives, there they are… alone, calm. They don’t show their faces much.” CACIF, the Executive Committee of Agricultural, Commercial, and Industrial Associations, comprises the country’s most powerful business interests made up of families widely considered an oligarchic elite. Untitled work by Mario Valdez. Valdez also depicts the Catholic Church and evangelical Christianity in the work. He cited their role in supporting the power structure that has made Guatemala one of the most unequal countries in the world, in which half of children under five suffer from chronic malnutrition. Valdez believes that religious leaders allow political leaders like Jimmy Morales to use anti-abortion or anti-gay marriage campaigns to cloak themselves in righteousness as they support policies that oppress and impoverish the country’s majority. Valdez mentioned that during Guatemala’s armed conflict, many Catholic priests preached liberation theology, a doctrine that emphasizes aid to society’s poorest and most marginalized. They helped poor communities organize economic cooperatives and petition for access to land, education, and better working conditions. But hundreds of priests and catechists were murdered for these efforts because they ran up against the interests of the elite, and because Catholic Church leaders often spoke out against liberation theology. Most evangelical churches of the era, supported by US churches and dictators like Ríos Montt, also opposed efforts to change the country’s power structure. 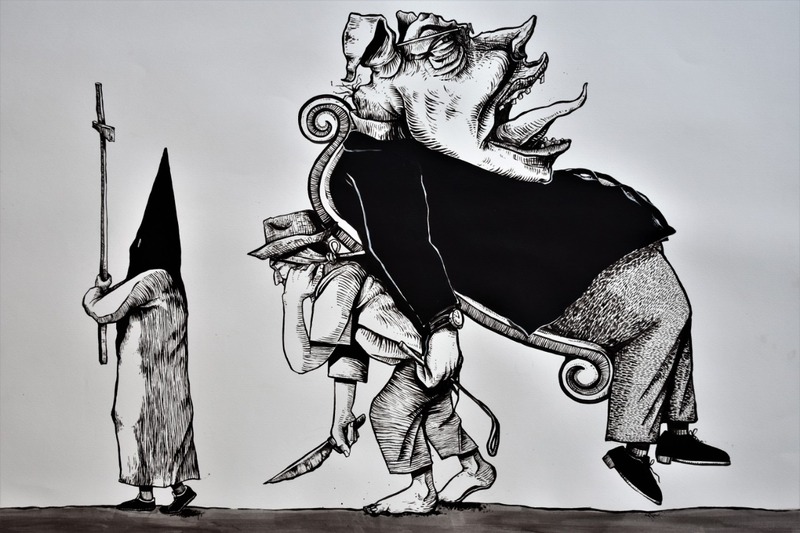 Valdez fuses past and present in his work to identify the causes and the agents of injustice, discrimination, and inequality as he sees them. 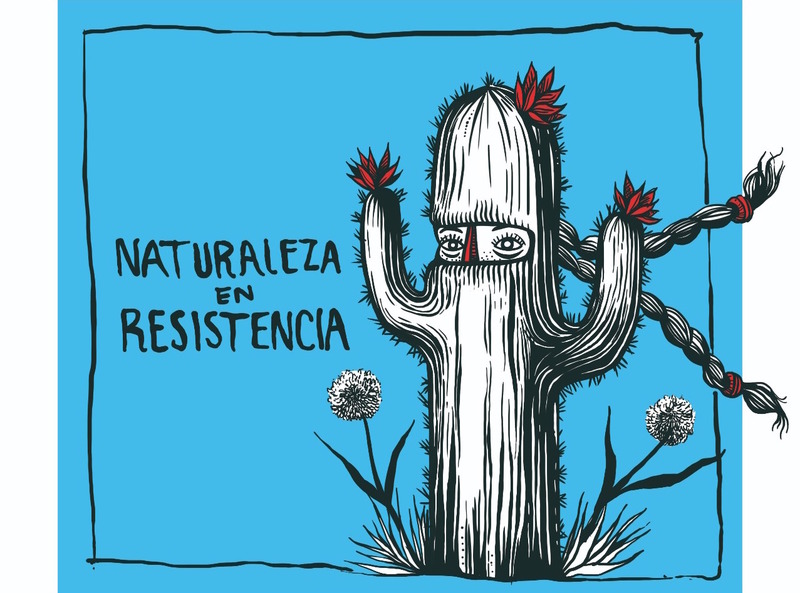 He is inspired by the art of Ramirez Amaya, aka Tecolote, who was forced into exile during the armed conflict. Amaya expressed ideas in “the most intense way possible,” Valdez said. Mural by Ramirez Amaya, 1973.